Y'Jazzmin Christopher, 7, takes up target practice at Archery in the Wild in Longmont, Colo. "She used to be a really shy person, but now she's opening socially," says Alicia Christopher, Y'Jazzmin's mom, about her daughter's archery. Following in the footsteps of Hunger Games heroine Katniss Everdeen, who's fiercely talented with a bow and arrow, is one reason Y'Jazzmin came through the door here this fall. Her mom, Alicia Christopher, says positive reinforcement has kept her daughter coming back. Y'Jazzmin competed in her first tournament earlier this month. "Watching the way that she's developed confidence in what she's doing — she's very confident," Alicia says. "She used to be a really shy person, but now she's opening socially." Alicia recently purchased a recurve bow for Y'Jazzmin. It cost about $130. And while that may sound pricey, archery store owner Boyd Wild says the high demand for recurve bows — the type Katniss uses in The Hunger Games — makes it hard to keep some models in stock. "It's taking about five months to get traditional bows right now," Wild says. "I mean, it's just going nuts all over the United States." Boyd and many in the archery industry are poised to capitalize on the surging interest in the sport. But Denise Parker, CEO of USA Archery — the governing body for the Olympic sport — says the boom following The Hunger Games original movie in 2012 caught many by surprise. "We didn't see that coming," she says. "We've had archery in other movies, but never kind of that whole momentum at one time." During the past two years, overall membership in USA Archery has more than doubled. Parker says there's room for more growth: In early November, the Archery Trade Association funded an ad campaign encouraging kids and teens to give the sport a try. "The imagery and the message, it's all a very new look for archery, and we've all collectively got behind it," Parker says. "I guess it's kind of our 'Got Milk?' campaign, so to speak, for the industry." For some archery shop owners, though, there's a tension between growing the business and offering quality classes. "If we were to advertise as opposed to just word of mouth, it would be insane," says Stewart King, a certified coach with USA Archery and owner of Rocky Mountain Archery in Fort Collins, Colo. In some places, the Junior Olympic Archery Development program is open to anyone. But for King's team, people have to try out. "Up until now we've capped the team at 40 shooters so that we can give the kids one-on-one direction," he says. "Because if I just throw a massive number at it, no one's going to get better." USA Archery is increasing efforts to train and certify more instructors to meet the growing demand. As Y'Jazzmin wraps up her Saturday morning practice session at Archery in the Wild, The Hunger Games is on her mind. "We have the book in the car," Y'Jazzmin says. She and her mom are headed off next to watch the latest movie — The Hunger Games: Catching Fire. And with two more films yet to come in the series, it looks like the odds may ever be in archery's favor. If you're a "Hunger Games" fan - OK, I'll admit I saw the new movie on opening night - then you're familiar with its bow-hunting hero, Katniss Everdeen. Well, it turns out her character has given a boost to the sport of archery, especially among girls. From member station KUNC in Greeley, Colo., Grace Hood reports. GRACE HOOD, BYLINE: The indoor shooting range at Archery In The Wild in Northern Colorado used to be dominated by camouflage and hunters. But on this Saturday morning, the archery range is dotted with ponytails and 7-year-old girls like Y'Jazzmin Christopher. HOOD: Following in the footsteps of the "Hunger Games" heroine Katniss Everdeen was one reason Y'Jazzmin came through the door here this fall. HOOD: Sitting behind the archers is Y'Jazzmin's mom, Alicia. She says it's positive reinforcement that's kept her daughter coming back. Y'Jazzmin competed in her first tournament earlier this month. CHRISTOPHER: Watching the way that she's developed confidence in what she's doing, like, she's very confident. She used to be a really shy person but now she's, like, opening socially. HOOD: Alicia Christopher recently purchased a so-called recurve bow for Y'Jazzmin. It cost about $130. And while that sounds pricey, shop owner Boyd Wild says high demand for recurve bows - the type Katniss uses in the "Hunger Games" - makes it hard to keep some models in stock. BOYD WILD: I've had some traditional bows ordered since June and they're supposed to come in next week. So it's taking about five months to get traditional bows right now. I mean it's just going nuts all over the United States. HOOD: Boyd and many in the archery industry are poised to capitalize on the surging interest in the sport. Compare that to 2012, when the first installment of the "Hunger Games" came out. DENISE PARKER: We didn't see that coming. HOOD: Denise Parker, CEO of USA Archery, the governing body for the Olympic sport, says the boom following the first movie caught many by surprise. PARKER: We've had archery in other movies, but never kind of that whole momentum at one time. PARKER: So that the imagery and message, it's all a very new look for archery and we've all collectively got behind it. I guess it's kind of our Got Milk campaign, so to speak, for the industry. HOOD: For some archery shop owners though, there's a tension between growing the business and offering quality classes. STEWART KING: If we were to advertise, as opposed to just word of mouth, it would be insane. HOOD: Stewart King is a certified coach with USA Archery, and owns the shop and indoor shooting range Rocky Mountain Archery in Fort Collins, Colo. In some places, getting into a Junior Olympic archery development program is open to anyone. But for King's team, you have to try out. KING: Up until now, we've capped the team at 40 shooters so that we can give the kids one-on-one direction - because if I just throw a massive number at it, no one is going to get better. HOOD: USA Archery is increasing efforts to train and certify more instructors to meet the growing demand. 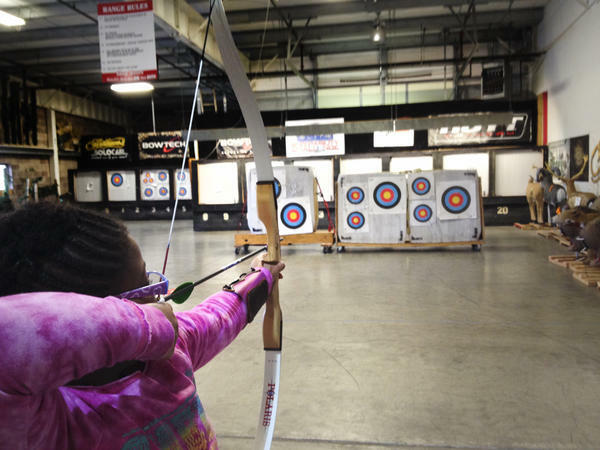 Back at the shop Archery In The Wild, 7-year-old Y'Jazzmin Christopher is wrapping up her Saturday morning practice session, and the "Hunger Games" is on her mind. Y'JAZZMIN: We have the book in the car. CHRISTOPHER: And she has already read it. What kind of bow is she shooting? Y'JAZZMIN: She's shooting a recurve, which is just like me. HOOD: Y'Jazzmin and her mom, Alicia, are headed off next to watch the latest "Hunger Games" movie. And with two more films yet to come in the series, it looks like the odds may ever be in archery's favor. For NPR News, I'm Grace Hood. Transcript provided by NPR, Copyright NPR.